Meet Ray Pye, a good boy who has an unhealthy fascination with....killing. He just wants to see what it feels like to kill a human being. From the opening sequence where Crispian St Peters "Pied Piper" plays over a low camera shot of a of black booted person walking fast in the woods over autumn leaves, towards an unknown destination, you get a very ominous sense of dread that he's not not on a errand that has a positive purpose in mind. Indeed, this opening scene takes a few unexpected twists and turns. And, with that, we just need to know exactly who is this dark & menacing character? What the hell is his real motives that for the chaos he is about to bring to this sleepy town? Ray is played with complete & utter conviction by an actor by the name of Mark Senter. Not a name I have seen previously, but if this performance is an indicator, then he is assured of a long career as a quality actor. Obviously, we will need to see him in other more varied roles before we judge him of any impending greatness. But, this is one hell of an intro! I've checked out on the IMDB and found that Marc Senter won a best actor award at the 2005 Screamfest. Totally worthy of such an award. Hopefully, it wont be his last either. Maybe if he could get a role in either a primetime TV series-or a blockbuster movie, his undoubted skills will be noticed by more people. Thankfully though, he is not the only good thing in this movie. From the jittery girlfriend, the wary & subservient best friend, to the dogged cops, the new female employee at the motel owned by Ray's mom & a myriad of supporting roles, no-one puts a foot wrong. We care about all these characters as they become increasingly tangled in Rays web of destruction. There is nowhere to hide as Ray gets more and more psychotic. Then maybe, a brief respite of sorts as Ray meets a new girl in town. The mysterious Katherine is attracted to ladies man Ray, who is clearly smitten with this newbie. She is just as cool & charming as Ray is. Indeed she is maybe, just maybe-more than a match for him. Then, after the honeymoon with Katherine ends too bluntly for the now obsessed Ray, he reverts back to the type of behavior he first exhibited at the start of the movie. But he's not a happy camper by any stretch of the imagination. No sir, he is now a man with a mission to fix everything that is wrong in his world, get out of his way fast-or suffer the dire consequences he has in mind. Hell hath no fury than a man infused with the belief that only he has the answer for the problems in front of him. And you just know there are going to be more than just fancy words spoken. Some pain is going to be delivered in the most sadistic way possible. The final shocking end scenes are a masterclass in heightened tension, as the every volatile Ray becomes irreversibly engulfed by a rage that wont abate easily. This is at times, unbearably brutal to view. But, you cant take your eyes away from the screen. You need to know how its all going to pan out. 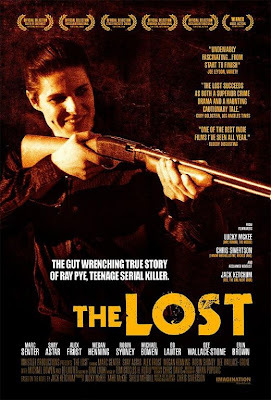 This festival movie is like my last post Shotgun Stories, another great example of the fantastic resurgence in the American Indie Movie scene. The disturbing fact that this is based on a true story makes it that much more gutwrenching.